Please Note – Our GTA V Competition is Now Closed. 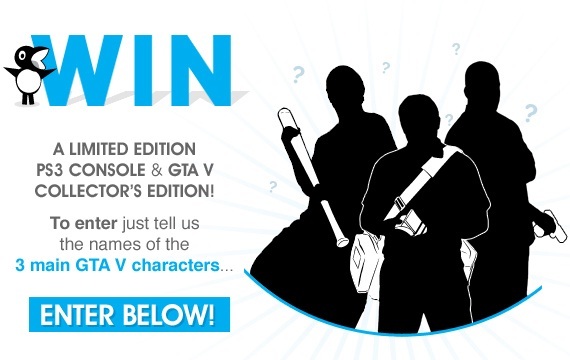 So the long wait is almost over; one of the year’s most anticipated games will soon be here, it’s GTA V – and now you could be in with a chance of winning yourself a collector’s edition of the game as-well as a Limited Edition PlayStation 3. 1st prize: Limited Edition PlayStation 3 (Azurite Blue) games console + GTA V Collector’s Edition. 2nd prize: Copy of GTA V Special Edition (PS3). 3rd prize: Copy of GTA V Standard Edition (PS3). All you have to do to be in with a chance of winning these awesome prizes is click here and answer the simple question. GTA V is the gaming release of the year and with the collector’s edition, you’ll be getting the best of everything GTA has to offer; as-well as the game itself, you’ll benefit from exclusive downloadable content, custom characters for GTA Online, a collectable SteelBook complete with exclusive Artwork, a Blueprint map, a New Era GTA V Snapback cap and a GTA V Security Deposit Bag. If all that wasn’t enough then you’ll get to play the game on a limited edition PlayStation 3! All you need to do is name the three central characters of GTA V (we don’t want to say too much, but there’s a pretty big hint to that question HERE, also if you keep reading, we might just let the answer slip). Once you’ve entered, we’ll select the winners at random from all the correct answers we receive – sound good? Great! Just click the button below to make sure you’re in with a chance of winning this fantastic prize! If you’re one of the only people on the planet who hasn’t heard much about GTA V, it’s set to take gaming to a whole new level. Set in the fictionalised city of San Andreas, the game’s storytelling focuses on the pursuit of ‘the almighty dollar’. For the first time in the history of the franchise, the game will have a multi-character structure focusing on Michael, Franklin and Trevor; three very different people who come together to pull off a series of heists. Gamers will be able to switch perspectives whenever they like and drop in on any of the characters to see what they are up to. As-well as the central missions, there’s the usual truck load of side missions to get to grips with, or you can just treat the city as your very own playground – so what are you waiting for? Just click the button above to enter our competition and you could be causing mayhem in San Andreas before you know it! For the competition’s full terms and conditions click here. ← Win the Limited Edition Blue PlayStation 3 and Bioshock Infinite!